Waite’s knight of cups is completely inactive, waiting for his golden goblet to be filled. The deepest wound comes from feeling isolated, waiting for love, direction, and like-minded people to come. Waiting for leadership. In the present, the Knight has lost his standing from too much waiting and has reverted into a fiery frustrated Page. He is inspired but isolated. He can’t figure out how to make things happen. The golden disks on either side of the powerful woman are the shield. She has become overly concerned with being grounded and having financial stability. This shields the wound, but doesn’t allow it to heal. In the progression of the Major Arcana, the Wheel is the second key to depict all four alchemical elements after the Magician. 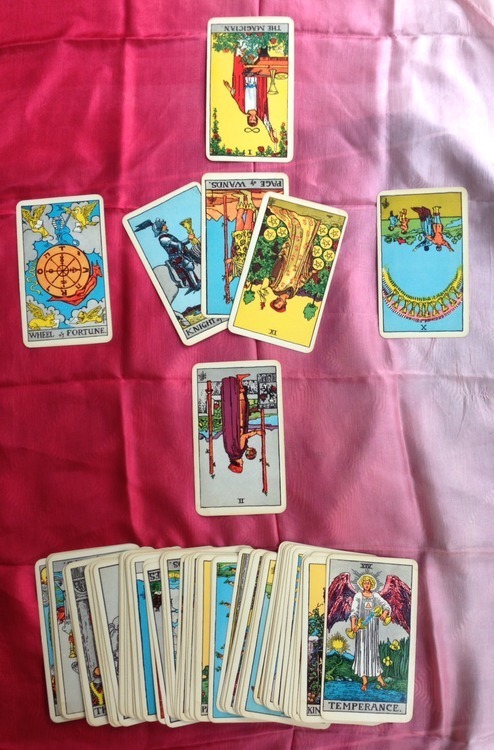 This is especially interesting as the center three cards of my spread lack the element of air. The Wheel seems to be suggesting taking a huge step back to assess the master plan. It could also be suggesting the cycles and routines I’ve set up in my life need to be re-assessed. To release the shield, I need to gain wider perspective which can be gained through the power of the sword. I’ll be looking for the Ace of Swords in further readings. And so here we are, back to the original master of each of the elements. The Magician is also the artist, the initiate and lightning rod that can channel all that energy from above and give it proper grounding. My wound has evolved into the Page of Wands reversed who feels very much like he wants to be a Magician, he’s getting all that inspiration energy from above, but can’t figure out how to release it and realize his ideas. My wound is the blue-print for my healing gift: un-reversing other Magicians that are stuck. We heal our own wound by healing others. The lord of dominion. Upright, this card shows a person who has taken advantage of everything the Ace offers, but there is a sense of loneliness in fiery success – this person hasn’t moved through all the elements yet. Reversed, this could be a person who experiences the world through reproductions, stories, and photographs but not first hand. This may be a person holed up in the walls of their own castle. In any case, after doing this reading I got a very random text message from a close friend containing an image of this card. 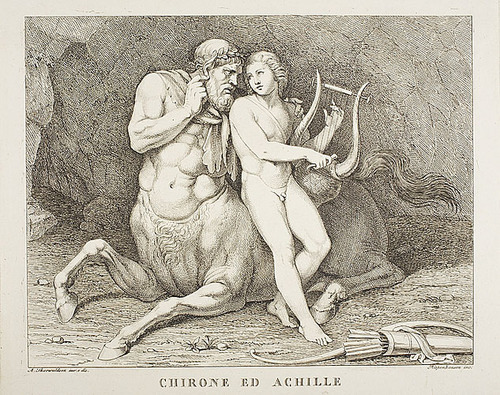 Chiron was healed when Zeus turned him into the constellation Sagittarius. I turned over cards through almost the entire remainder of the deck until I found Temperance/Sagittarius. I will carry this wound for a very long time, but will also have this healing gift every step of the way.